Flashing ROMs can be a tricky process, and sometimes you can end up leaving yourself without a ROM at all, often referred to as a soft brick. If you accidentally wiped your internal memory before a flash or forgot to download the ROM before wiping your system partition, don't worry, there is always a way to get your phone back up and running. 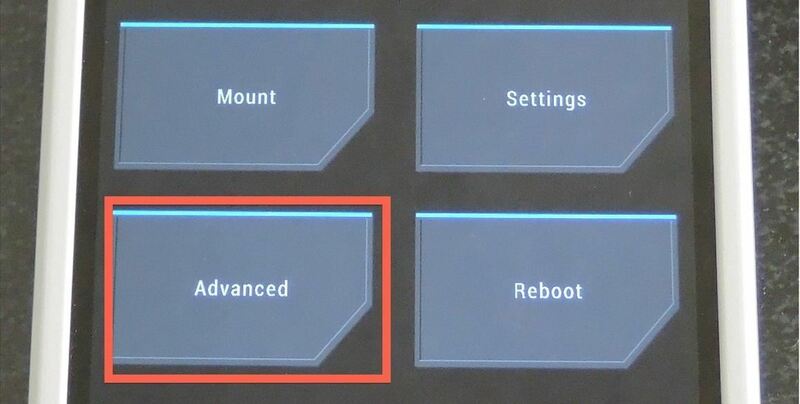 If you find yourself only able to boot into your bootloader menu, there is a special mode in TWRP called ADB sideload that can be used as a last resort for flashing a ROM. It works by connecting to ADB on your computer to flash a .zip file of your choosing. Since this is a slightly more complicated method of flashing a ROM, it should only be used as a safety net. Before moving on to the actual step-by-step, make sure you have a few basics ready to go. Your phone must have an unlocked bootloader since we will be using a custom recovery to enter ADB sideload mode. Have ADB installed on your computer. Download a copy of your ROM onto your computer and place it on your desktop. Links for stock ROMs can be found in Step 3 below. If you're using a custom AOSP-based ROM, you'll also need a Google Apps package, which can usually be found wherever you got your ROM from. If you have an unlocked bootloader, then you most likely already have a recovery installed, but if not, you're going to need to flash TWRP to your device using ADB. 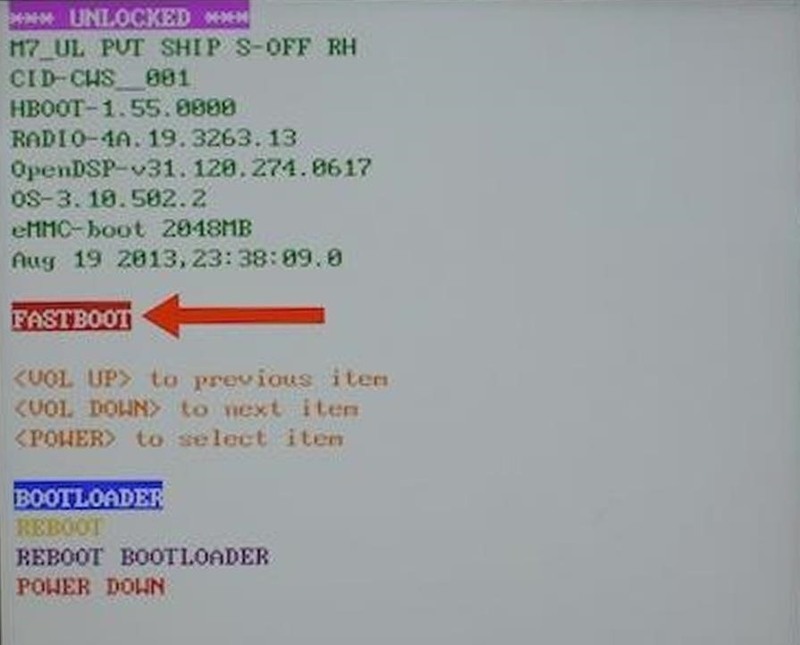 With your phone at the bootloader menu, place it in fastboot mode by connecting it to your computer. To make sure, check that FASTBOOT is highlighted in red. If it is not, select it from the list using the Volume buttons to navigate up and down, then hit the Power button. Open up a terminal (command prompt) and make sure your computer can recognize your device by typing fastboot devices and hitting enter/return. As long as you see a device model under that command, you will be good to go. Download the latest TWRP for your device, and be sure to download the file under the ADB/Terminal Method section. After the download finishes, rename it to TWRP.img and place it on your Desktop. Flash TWRP onto your device using the fastboot flash recovery Desktop/TWRP.zip command. 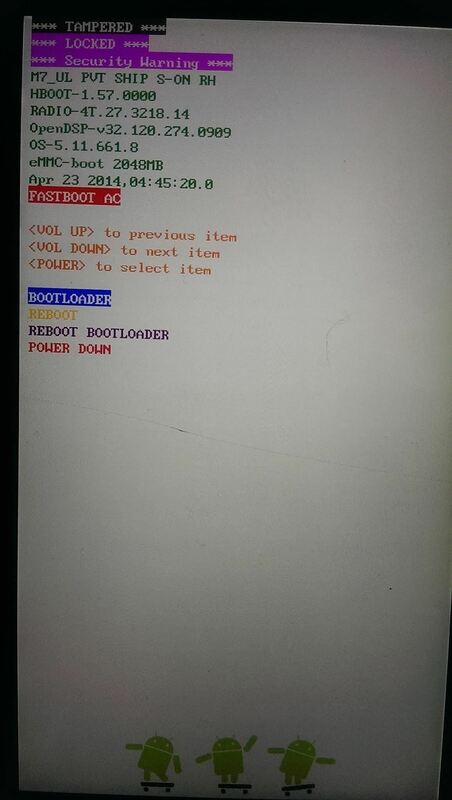 Reboot your phone using the fastboot reboot-bootloader command. Since your device only boots into the bootloader menu, all you'll have to do is highlight the Recovery option using the Volume Down button and select it with the Power button. If you do not see the Recovery option, just select Bootloader with the Power button and it should pop up. Once in TWRP, tap the Advanced option and select ADB Sideload. From there, you will be given the option to Wipe Cache and Wipe Dalvik Cache partitions, so go ahead and do so by checking the boxes and Swipe to Start Sideload. After it starts, you will be ready to start your ROM flash. There are many custom ROMs out there for the HTC One M7, so feel free to flash one of those through ADB Sideload. However, if you are looking to just get back to stock Sense, the ARHD team has a ROM.zip on their site. With your device connected to your computer and your ROM file already on your desktop, you are ready to flash. 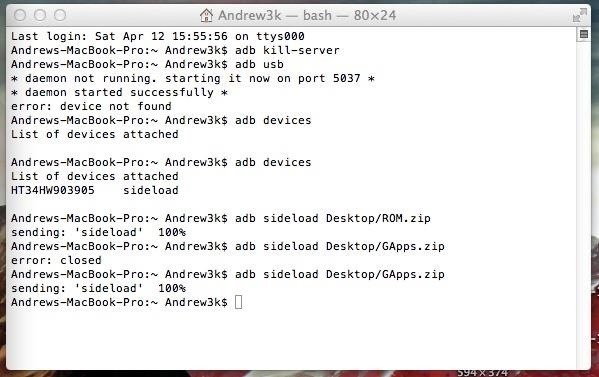 Kill ADB using the adb kill-server command, then restart it with adb usb. Make sure your computer can identify your device with the adb devices command. Flash your ROM with adb sideload Desktop/ROM.zip (be sure to change "ROM.zip" to the name of your ROM file). Flash your GApps package using the adb sideload Desktop/GApps.zip command, but change 'GApps.zip' to the name of the GApps package you downloaded for your particular custom ROM. Tap Reboot System on your device. If you are getting an ADB error, cancel the sideload from your phone, unplug and replug your phone, and restart the process (see video). Now, this won't fix every problem, but a vast majority of ROM issues can be solved by using this method. If you have any questions or just need some general guidance on where to go from here, be sure to leave a comment below. sorry I posted in the wrong place. touch screen not working on TWRP on my htc one x. tried installing 2 versions of TWRP.. This guide was meant for the One. If you have a One X you are going to need to flash a different version of TWRP. Check the device list on the TWRP website for the one you need. My htc one won't connect to my PC when i plug it in in fastboot any ideas what i may be doing wrong? What error are you getting from command prompt? It may sound silly, but try using different USB ports. Sometimes my PC gets picky with that. If not, check to see if you are using the newest fastboot version. Are you using a USB 2.0 port? What version of Windows are you running? Is your Hboot version above 1.55? same response i get. i have tried several times to no avail. i am using usb port 3.0 and my Hboot version is 1.57. pls help. Have you updated adb recently? Try unplugging and replugging your device into your computer before typing adb usb. I tried by remove and replug cable before "adb usb" command but same result. can i use my otg cable, to flashing cm11.zip if yes how?? Make sure your usb drive is formatted to fat32, copy your rom.zip on it, connect it to the phone using a otg cable. Then boot twrp, select Install, click on storage: Internal Storage (X MB) then select USB OTG (X MB) and finally select the rom.zip. You should stick with using the newest version of TWRP. Depending on how far lost your device is you may want to reformat your storage using the option in TWRP's Wipe menu. This will erase everything on your device though. can I use m7 rom? i have the same issue. 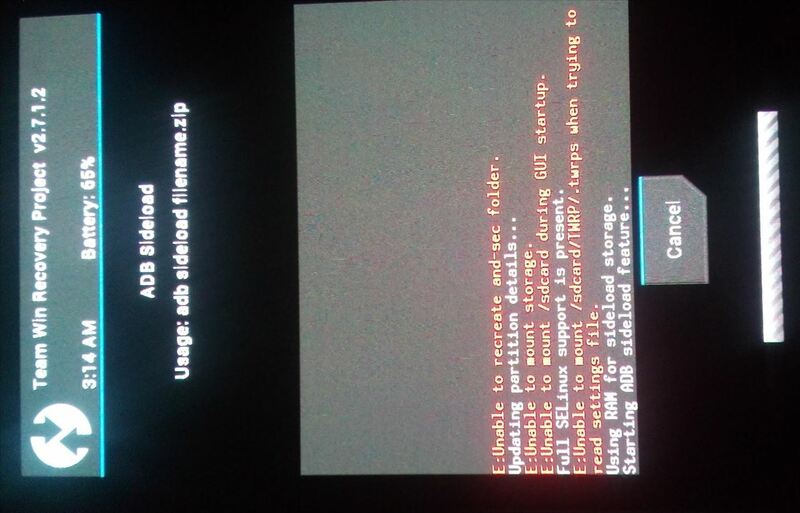 it just shows the twrp screen and reboots itself .u found a solution to this? I have got to start the recovery mode. Can your device boot into ARHD though? If it can and adb recognizes it use the command adb reboot recovery to get it into recovery mode. If not you can always reflash it from fastboot mode. i sideloaded a rom and it went through 100% and when I went to tap reboot, it still said no os installed. I rebooted to a htc quietly brilliant screen boot loop. any thoughts? Did the ROM include and AROMA Installer? If it did that will need to be completed before the first boot. Sometimes if your device locks itself during the sideload the AROMA installer won't start. i have tried 6 different roms. no mention of aroma with any upon download. I am familiar with aroma, but not so familiar with twrp. Mostly cwm. So if I find one with aroma, after it hits 100%, how do I enter the aroma installer before swiping the reboot option? Have you updated fastboot on your pc and your hboot on your One? finally got an os installed. it was because I kept walking away and letting the screen lock up. thanks for the tip! keeping the phone awake during sideload worked! What did you do when you were transferring the rom file from mac to your device? I tried it went 100% but somehow the log on my phone didn't seem to play. It was stuck. after it swtched off went back to recovery mode still said no os installed.!! Any idea..
IS THE DETAIL OF MY HTC ONE* FROM WHERE I WILL DOWNLOAD THE ROM???? de-attached usb and again attached but nothing showing what to do??? Put your device into fastboot mode by restarting into the bootloader menu and then selecting fastboot. Once you have it in fastboot mode run the adb devices command to see if it pops up. he tell me fastbot is not recognized as an internal or external command operaple program or batch file ! That means you need to install fastboot again. now my device stuck in boot loop...plz ANDREW GODINEZ help me...i want my device back in in life.. Sounds like you need to reflash your ROM, so if you have TWRP you can run the same sideload commands as I did in this guide. I tried flashing the stock ATT rom and is shows that it uploads 100% but then TWRP shows failed with a missing MD5 file. Do I need to use another rom? That may mean the ROM you downloaded is corrupted. Try redownloading and reflashing. You already wipe all of your partitions and are using a S4 compatible ROM right? when I tell it to flash rom it says it can't read the location thing. Are you using OSX or Windows? I am using windows. Also before you replied I got a little frustrated, and found a new command, fastboot flash boot boot.img, and I used the boot.img I found on the rom you told to download. My phone is finally working and is not soft bricked, but it is still glitching like crazy. It lags alot when I swipe the screen it takes 2 seconds for it to respond. It takes a while to download an app, and every 3 seconds it starts lagging. Also When I turn the power off, It says shutting down, but it never actually shuts down. When I hold the power button for 10 seconds to shut it off, it turns off but 5 seconds late it turns right back on. The only way to have it turn off is to go into fastboot and go the shutdown option. You may need to restore from an RUU. This guide goes over how to do that. You may need to manually put the adb and fastboot files in your /usr/bin/ folder. Some users have the same issue and that seems to fix it. Yupp, that fixed the problem. Thank You. Hi Andrew, I'm desperate here. I've done so many things and don't know how to fix it anymore. s-Off. What can I do to get it working again, I really need your help!!! Try cleaning your cache in fastboot and then restarting into recovery. If that doesn't work I'd try and re-flash your firmware. It didn't work. As soon as I go into recovery it stats rebooting until I enter fastboot!!! **** Did you mean to fastboot format this partition? I just flashed the firmware and twrp and it's still doing the same. When I go into recovery it stays there 8 seconds and reboots by itself and doesn't stop until I hold vol down. Hye Andrew, do you have any idea of what's happening to my device and how to fix it? Hi Andrew, I've been able to install CM11 and the phone is working. It wouldn't take the other roms I tried. I se an error on mounting internal storage and mounting to ram. I still need help though. I am really appreciating your help. Have a good night. At this point I would recommend restoring from an RUU. Make a backup of your data before hand because this will wipe your device. They told me that I must relock my device before RUU, is this correct and how do I do this? You do not have to, it says that because they assume you want to go back to 100% stock. You just need your system reset, so don't worry about that. Where can I get a RUU for att htc one m8 and how do I perform the ruu process? Sorry, I totally forgot you were using a M8. There aren't any RUU files for the M8, but you can use this XDA guide to get the the same results. Just be sure to get the right firmware files. Are you putting your device in sideload mode? Did you kill and restart adb? Hi andrew, how much time will this process take...i mean after starting sideload ......mine is taking too much time...? It should take a couple minutes to send over your ROM and then a few more to actually flash it. Hello Andrew! I have the same problem like "CHRIS HERNANDEZ". And the cmd says "error: device not found". 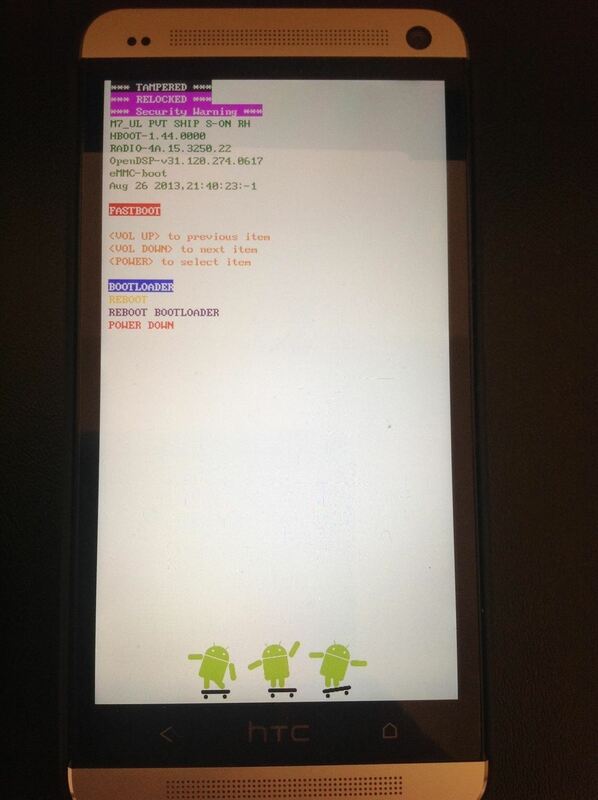 My device is in adb sideload mode, any anwer? Try it with a different USB port. So I take it you looked at this XDA thread? If not relock your phone through fastboot with fastboot oem lock. Then download this RUU, extract it and then run it. Following your instructions right up until the last part of step 4, I was ok. However whilst flashing the rom to my phone, it reaches around 80% and then the number disappears leaving just the percentage symbol. I've tried flashing different roms multiple times, yet the problem persists. Do you have any idea of what i'm doing wrong? I can give further details if need be. Thanks in advance! I'm also using clockworkmod as opposed to twrp if thats of any help. I've personally only used TWRP for this reason. Sometimes adb push can be unreliable on cwm. Are you familiar with flashing a new recovery? I am not. Is there a specific tutorial you recommend? It's a soft bricked HTC One M7 by the way. E: unable to mount internal storage. E: unable to mount /data/media during GUI start up. E: unable to mount /data/media/TWRP/ . twrps when trying to read settings file. Are the phone/system files corrupt beyond repair? Never mind, after a factory wipe the rom flashed to 100%. The phones working perfectly now. Thank you! Hey, I wanted to get to 100% stock with a Roger's HTC One M7. I rooted in but ended up deleting the OS and don't have a backup either. S-ON and h boot 1.57. Is there anything I can do? Also getting an error that says "error cannot open TWRP.img" in the cmd prompt. Can you help me please? Can you post a screenshot of your cmd commands, including the error. Hello Andrew, I've found your tutorials very useful but am currently having trouble after having "rather foolishly" soft-bricking my GSM HTC One M7. I've followed all the steps and have read the solutions in the comments above, but to no avail. The step in question is Step 4. 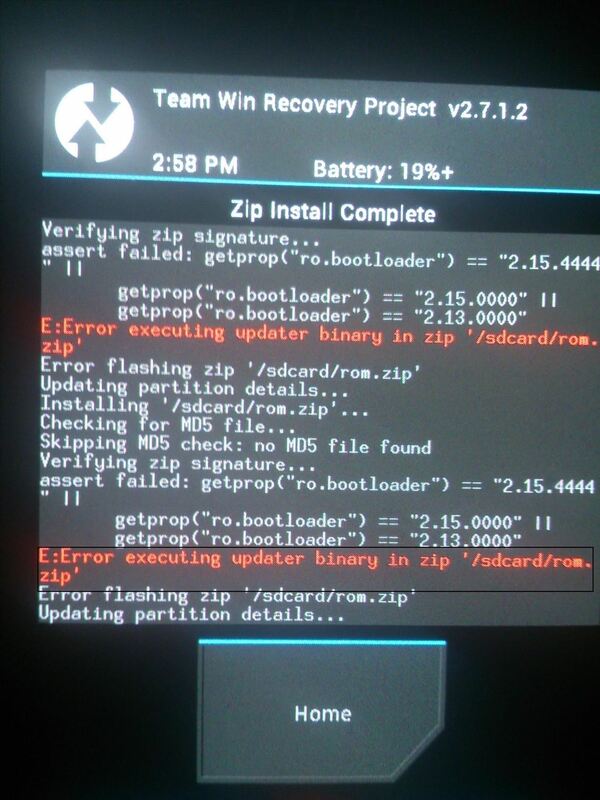 I have booted into TWRP Recovery v.2.7.1.0, and have booted into adb sideload. You can also access your device while it is in the advanced settings menu of TWRP. So leave your device at the advanced settings menu, kill and restart the server (if it doesn't read your device the first time re-run the commands), and then once it finds your device push your ROM.zip over. Now you can install the ROM as your would normally. I've done as you've asked, but again, it's of no use. Irrespective of which USB port I use (again, both 2.0 and 3.0), I still get the "error: device not found" line. Would a USB Female to Male Micro-USB attachment to my phone and attempting to load the ROM from a USB, bypass this issue? Any other methods? I'm getting desperate here! Eek! Appreciate any help put my way, thanks again! You do not need to be S-Off. If you have USB OTG cable you can install a ROM with it through TWRP. OTG cable arrived today. Up and running within 15 minutes. Thank you for all your help! Due to my mistake I cleared everything which was stored in internal-memory cm11.zip also there. now i can access only twrp older version and into recovery. how can I use my otg cable to install cm11. I tried to plug otg cable into usb port but can not find my pen drive in twrp menu. please help as there is nothing left in the phone. Im having this exact same issue. Every ROM I've tried, I keep getting the same error as above. Any help? Post a screenshot of your commands and I'll check them out. hi, i've tried the steps above, however my htc m7 isn't being detected by adb. I'm using osx mountain lion and my phone is hboot 1.56 s-on unlocked. fastboot works fine and i can flash different recoveries no problem. I also have an otg cable but it doesn't seem to be connecting to my phone either as when i plug it in there are no files or anything added in twrp. Did you enable USB debugging and accept the RSA key on your One when plugging it in? You may need to run the commands a few times to get it to recognize your device. Once it finds your device push your ROM.zip over. Have you installed HTC Sync and its drivers? flashed twrp 2.6.3.3 and reinstalled adb which got it to connect and managed to use the push command. On step 1, number 5 I get this: cannot load 'Desktop/TWRP.zip': Unknown error. Any ideas? Should it be /TWRP.img? Also, I wasn't able to get either TWRP.img or ROM.zip to load from the desktop (Destop/). I had to put the files into the folder where abd was living and then all went well. Thanks so much for this. It was very helpful. If your bootloader is unlocked you can use this guide to get it up and running again. I am needing ruu for htc max sprint any ideas deleted os system? I found this link for a One Max RUU. Hello i just got this problem annyone got a fix for it ? If you are using a Windows PC you have to include the Drive letter when sending your sideload. The easiest thing to do is to place the ROM in the parent folder of your C drive, so it would be C:\ROM.zip instead of Desktop/ROM.zip. did it but still getting the same error any other possibility ? Are you using a ROM made for the One Mini or the M7? If not id need to try other stuff with repairing would it work to get a usb stick put the data on it plug it in to the phone with usb go to recovery use twrp to search for the usb driver stick search the data on it and install it from there ? You may want to format data from TWRP. Wipe -> Format Data. This will completely erase your phone of all data, so pull any files you need before hand. Does it have an unlocked bootloader? Have you flashed TWRP? You need to flash TWRP in order to sideload. Just download the newest version. My device is connected and adb recognizes my device. I am able to boot in TWRP no problem. I renamed my file to ROM.zip and ran the command like you provided but still nothing. Any suggestions? I should add that the ROM I downloaded was one of the stock ROMs your recommended. Thats the one that I can not side load via my Mac. Hi, when at the command prompt of " adb devices ", my device never shows up no matter how matter times I unplug and plug it back in. I restarted the whole process too and it's the same thing. With Unlocked and Tampered flagged. Have you updated ADB and Fastboot to the newest versions? It all works until the "adb devices" part. 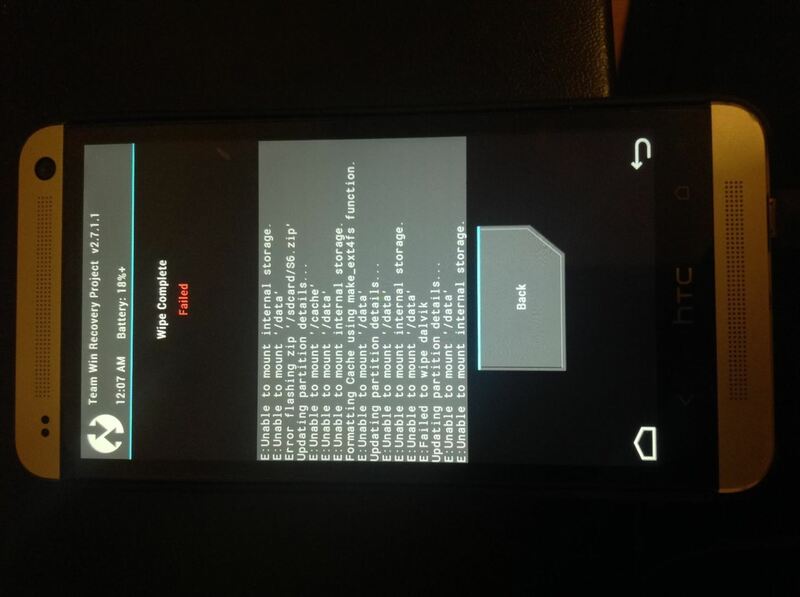 After the "adb kill-server" and "adb usb"
Try updating the HTC drivers. Download the newest HTC Sync and it'll update everything. I've updated the HTC Sync Manager already and it still doesn't work. 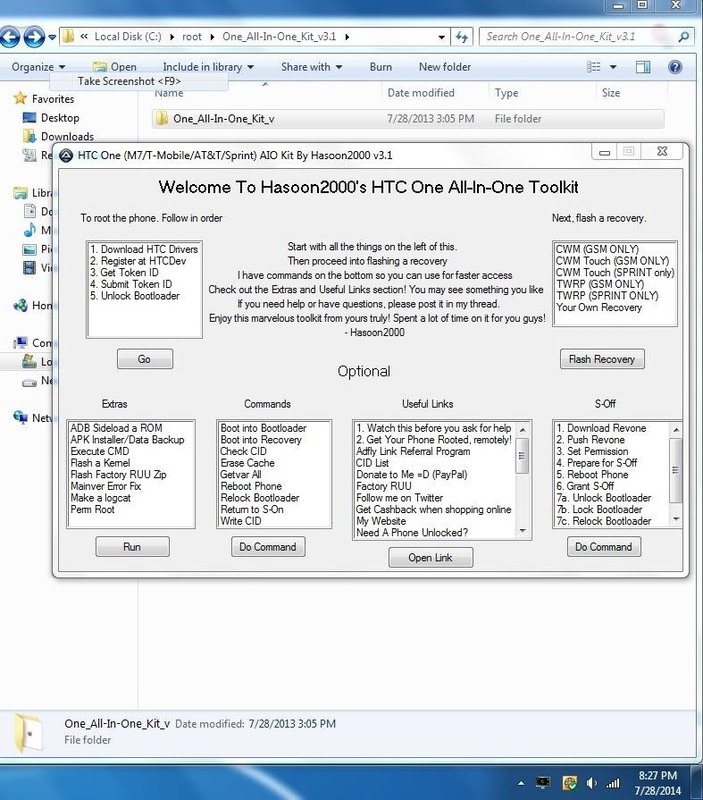 go to the HTC driver folder find the ADB of HTC and delete it ! I went to the HTC Driver folder and couldn't find any ADB in it. Any idea or other suggestions? Are you using a USB 2.0 port? Try using a different port. I've tried all ports already. And I don't have a USB 3.0 port. Initially I rooted and flashed TWRP. Every was okay. Until I update my software on the phone itself. It started a reboot loop. And I went into recovery and factory reset or wipe everything. Can't remember. And after that, it's stuck on the HTC logo and when I tried to reboot it in Recovery, it said there is no OS. It recommened SuperSU but I tried installing to no avail. Thank you so much - you are a life saver for me. I accidentally formatted my htc one and wiped everything off it including the rom. Your easy to follow steps helped me a lot. Hello. It seems I don't have the correct twrp recovery file as the phone won't enter into recovery mode, and the phone is now bricked. I have an HTC One Mini running 4.4.2 - and none of the following files from seem to work. Would you have any clue as to where I could find it ? Or maybe I should erase the previous twrp files I have flashed on the phone before trying any others ? I am new to all this and can't seem to do the right manipulation although I have tried for hours. Thanks ! fastboot flash recovery "location of TWRP.img"
You can then sideload a ROM. If you are using a windows pc you will have to change that part to include the drive letter. So if you place the ROM in the parent folder of your HDD it will be C:\ROM.zip. Hello friend I can get here, but it will not anymore, please help me, what can I doing wrong, or is something wrong on the computer Thanks. Where did you place the ROM.zip? I put in the platform SDK folder tolls. I've tried everything, but it seems I need to change the directory of the rom, but I'm confused to do this. Not yet buddy. My God help? If that doesn't work check to make sure you don't have the ROM file in a folder. The commands are case sensitive, so keep that in mind as well. flash TWRP v2.6.3.3 .It worked for me ! what do i do if my Hboot is 1.44 rather than 1.55 or higher? You would need to get a ROM that is compatible with 1.44, or update your system. so i decided to go and use RUU files, and saw a video on that, and it said that both numbers in Image Version should be the same, but as shown in the photo, mine doesn't have the first numbers, i didn't continue though, so.. should i? or should this be an issue? You should be safe to continue. What is your CID/MID? You may be flashing the wrong RUU. That model doesn't have a RUU, so that is no longer an option. What ROM are you trying to flash that gives you error? Try pushing the file to your device while it is still on the regular twrp screen adb push location-of-ROM.zip /sdcard/. Then wipe wipe your cache, dalvik, data, and system. After that install your ROM like you usual. Looks like you will need to reformat your data from the wipe menu. Have you tried reflashing TWRP? Sorry, I forgot that you relocked your bootloader. What you are going to need to do is make a new unlock code from HTC Dev and flash that to unlock your bootloader. Then flash TWRP, reformat your data, push the ROM over, and finally install it. did everything but both ROMs that I'm testing don't work, should i try another one? or the error is somewhere else? What error is TWRP giving you? Hope you guys have as much luck as i did. I was up all night trying to find out how to do this and now I'm sharing it with you guys. This and the model of HTC M7, I tried putting back the stock Ruu, but even that I did not get success, what do you think Andrew. Does your modelid always display like that? What was your original CID? Arrived for min has only 25 days, is bought 02 months, is made ? ?in taiwan. Sorry, what was your original CID? I already bought it with this cid. Bought in Singapure, unlocked, gsm, lte. Since you are S-Off you can use this guide to flash this RUU.zip. Otherwise you can use TWRP to flash this stock ROM. I did root with HTConeRoot then did fastboot oem unlock with lock, try to get back to stock? Do I need to unlock again to try any of these options? First got run sideload, but failed. why? All you have to do is place your M7 in RUU mode (fastboot oem rebootRUU) and then flash the RUU.zip (fastboot flash zip location-of-RUU.zip). You will have to run the last command twice. It does not matter if you are unlocked or not. No friend in fastboot mode so I can connect, the more command I got nothing yet, just the way I managed to sideload the first flash but failed, how do I sideload the only way to resurrect him after we see something else. I'm having a hard time trying to figure out what you are trying to say. Does your computer not recognize your device in fastboot mode or does it fail once in RUU mode? CM11 intend to put in it, so you can be fine, as I do? Right now Sense ROMs are only up to Android 4.4.3. If you wanted to get to 4.4.4 you would need to flash CM11. That would require you to flash the CM ROM and Google Apps package through TWRP. 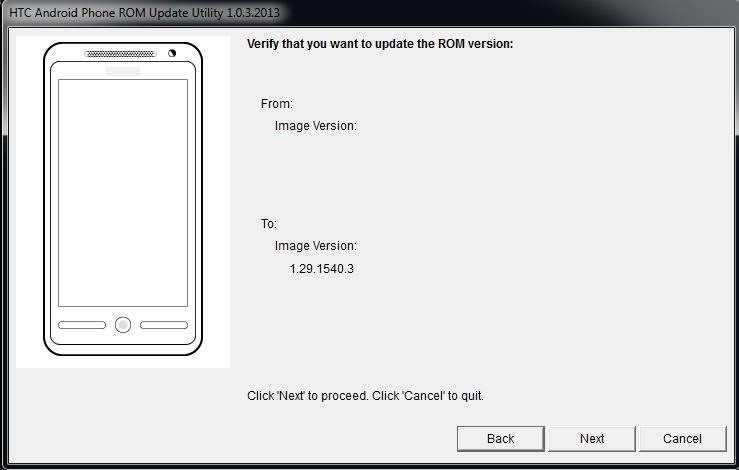 I would update your device through HTC OTAs to get to 4.4.3 first because that would also update your firmware. I've been thinking about it, and I only update it to android 4.4.3 sense 6 if battery consumption is good I continue, if not, move to CM11 battery consumption and lower CM I've seen so far. Thanks again, and a big hug this Brazilian Minas Gerais Brazil. Are you using the TWRP for HTC One S or M7? What ROM are you trying to flash? M7 ROMs will not flash onto a One S.
and if its not working what kind of roms should i install ? Try using this version of TWRP to flash. i have tried a lots of roms what to do ? i have suggestion could i copy the custom rom into my phone using adb push and then install cwm and then install the rom from it ? Check out this XDA thread and you could use one of the RUUs to install stock Sense. Check your CID/MID with fastboot getvar all to pick the right one. 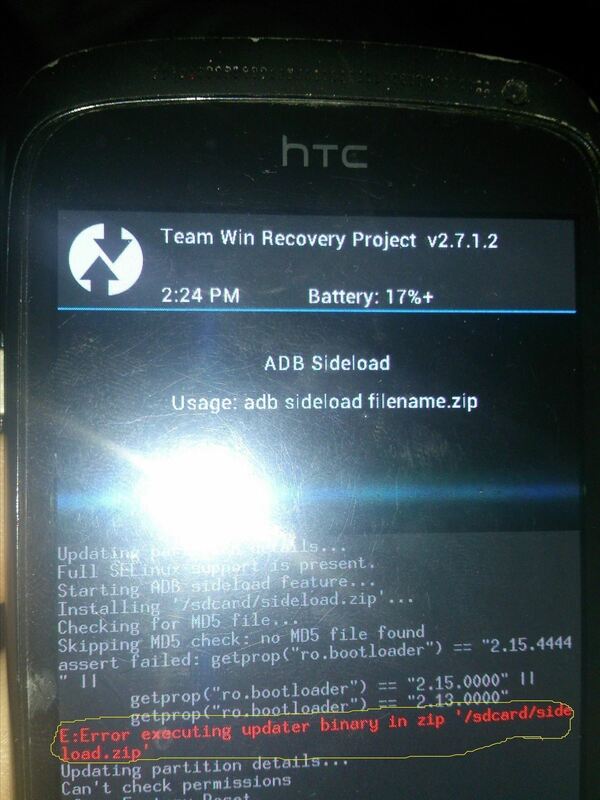 hey my htc connects to fastboot and did a the work shown in the video without any error" but once it enters recovery it shows me teamwin page and skip to the htc symbol page without entering the options page and gets rebooted dont know what to do..even my adb isnt working ,bootoader got unlocked ..
Have you tried redownloading and reflashing TWRP? Hello Andrew Godinez, M7 upgraded to sense 5.5, but I can not turn on wifi, wifi shows my linskysys mode, but can not complete the connection, you can give me an explanation why this is happening? Were you trying to flash a new ROM or tweak before this? Do you have a custom recovery installed? great tutorial! still i dont get it done on my m7: bootloop for weeks now. can flash new rom (tried several like arhd and stock) but still im in bootloop. even recovery is broken. bootloader-recovery=not working! bootloader-factory reset=recovery starts! possible it has to do with battery? bootloop started when i pluged charger! I've tried this many times but still get the same. I've HTC Sync, re-attached usb and again and again ,i Used different USB port but nothing. Check windows device manager to see if your pc can read your M7 while in fastboot mode. If not try uninstalling and then reinstalling the drivers. Thank you again one more time!!! i used TWRP and formated data...i dont have any os on my phone. Wondering the same thing myself on my 0_44 and I'm getting the No md5 file found when I sideload my 707.4 file. However I'm not getting a zip file is corrupt. My current situation is basically no OS on my M8, all i have is TWRP and an unlocked bootloader s-on. What exact error does TWRP give you when you try to flash the ROM? Where are you downloading ROMs from? Now you can install the ROM as your would normally." My htc is softbricked yet locked. Is there a way i can unlock it under this status? What exactly is wrong with your device? 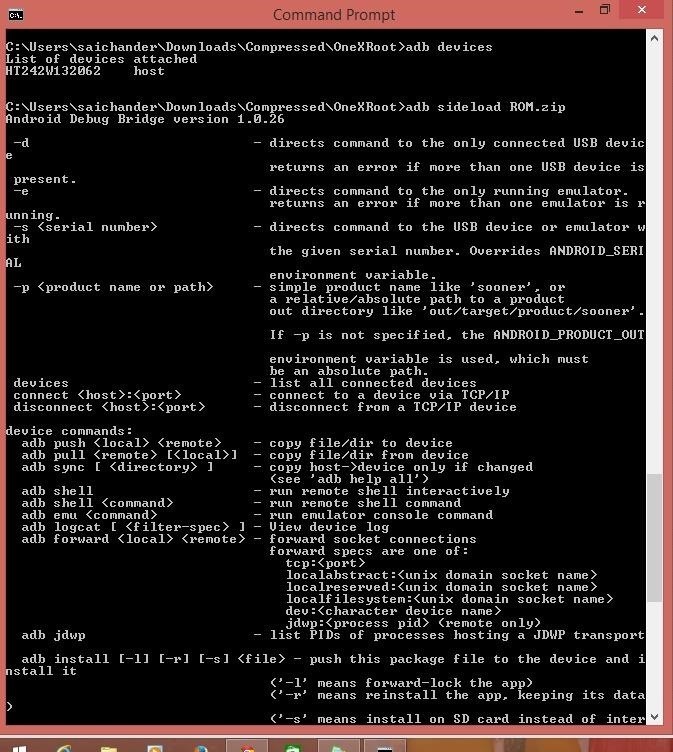 How should i connect my device to adb?? If your M4 doesn't start past the bootloader menu you will only be able to use fastboot. 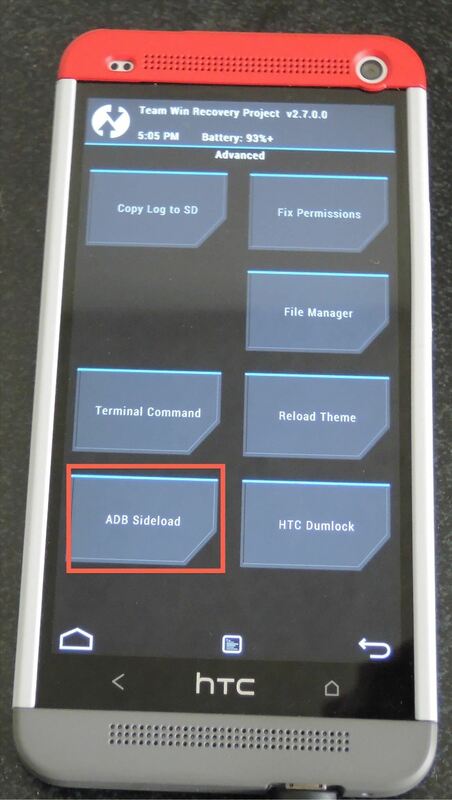 When you flash TWRP and use the ADB Sideload feature you will be able to use adb. I am stuck! am getting stuck on the "starting adb sideload feature..."
Adb devices shows my device as host. Tried kill server - start server... tried adb push! And my phone is soft bricked. The only rom currently in my internal memory is faulty and am unable to flash another via the push..
Next time stay at the TWPR main screen and then try to push over the ROM without starting sideload mode. The command to push over the ROM file would be adb push location-of-ROM.zip /sdcard/. If that works you will be able to flash the ROM.zip the normal way. did you manage to push the ROM onto TWRP to solve your issue? I seem to be having a very similar issue. I have very little experience with rooting etc, but can't afford to get a new phone. ....so Im really hoping you can help! Last spring my husbands phone kept going to a locked tampered screen when the phone's battery got low. We never tried to root it, or anything like that, but after charging it would boot up ok so we just chalked it up to a bug of some sort...and ignored it. ............until I screwed up and accidently pressed the check Smart SD button...then everything went to hell in a handbasket! Now when we go to start it I get a "System UIDs are inconsistent ....need to wipe your data partition..etc" message. The only option is to press "Im feeling lucky" and then you get messages popping up over and over again saying "Google play services has stopped" "com.google.process.gapps has stopped" "& "Settings has stopped" The messages never stop...so it won't start. If I drag down I can get the menus, but it is useless if you can't get into the settings. In the fastboot menu...nothing will work...factory reset just vibrates fashes the logo and then goes back, recovery does the same thing, ...the only thing that works is reboot, which brings you back to where we started....UIDs inconsistent. We sent it in to a shop where they said they couldn't flash it that it was toast...but I don't want to give up that easily...there must be something I can do!!! HELP! Please. Your unfortunately going to have to walk me through it....as I have never rooted a phone before, but I am not completely ignorant with computers. To start you are going to need to unlock your bootloader so use my other guide to do that. After you get to the part where you flash TWRP come back to this guide and go through the steps for flashing a new ROM. I am not sure if this will fix your problem, but it would be my best guess. For ANYONE with the 'cannot read' sidearm problem, I've found the problem with this issue that was the only thing stopping me before. I was almost crying when I thought I might've broken my brand new phone, so I know how it feels to be one of you! You must place the ROM in the Android folder containing your adb directory. For simplicity sake I moved the folder to C:/Android -- perhaps that also made a difference. Before, I used cd Desktop/Android with no luck. I had tried exactly this, without including the .zip on my ROM's name, and it failed. I installed SlimROM for the HTCM8 by the way -- I'm sure this could work with any others, but I just wanted to test the sidearm transfer out with a smaller file. Are you trying to exit from sideload or TWRP? I have a Toto tv Lap one netbook. When I power it on I get the Toto icon and a message: Boot into recovery mode. The netbook does have a reset button below and I followed the recommended procedure but it just goes back to the original screen with the boot message. Is there some way I can overcome this. I have a pc I could connect to it. The problem started when I used Android Device Manager to wipe and reset it to factory defaults. If this is the wrong place to post this could you recommend a proper place to me. Thank you for your time. I have followed step-by-step the instructions and adb have flashed correctly the ROM, but when I try to reboot my phone, the TWRP advise me not to reboot my phone because there is no OS installed. 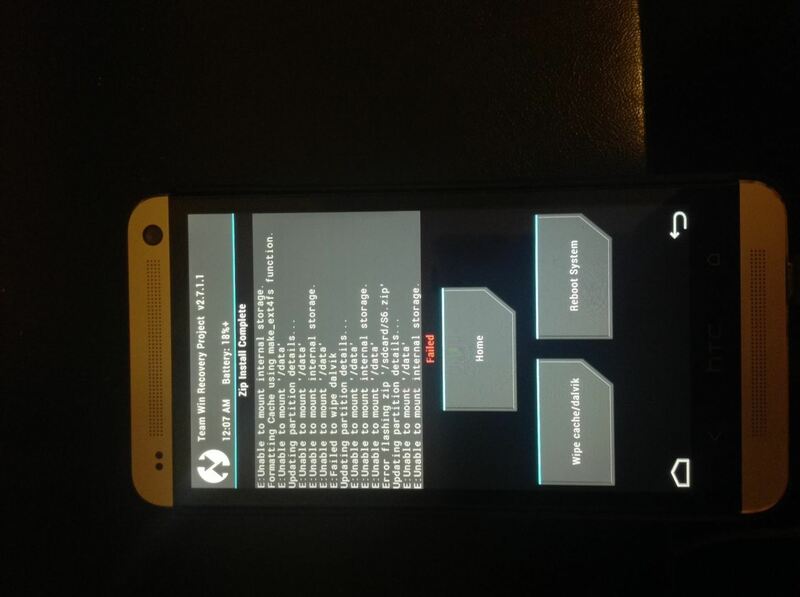 I've tryed several times the procedure but my HTC one is still in bootloop, help me please. When you flash the ROM does it say it flashed successfully? Did you manage to sort out the 'no OS installed' issue? I'm still struggling with the same issue. please help... when transferring rom.zip, it loads up to 85% and then stock without moving further! Rename the ROM.zip and retry. installed HTC drivers and updated. What happens when you enter the command adb devices? What happens when you power off and then press and hold power and volume down button? Just keep holding down the two buttons and eventually it will enter bootloader mode. it worked........thank you.......how to i delete my previous custom kernel?? You can use this kernel for CM11 on your M7. The boot loop happened because the kernel you flashed was incompatible. Also, make sure your ROM is always up to date. Leave your device off for a few minutes and try it again. You may need to restore your device with an RUU. You can use this guide to install a new ROM just be sure you have TWRP installed first. when I type in "adb sideload Desktop/ROM.zip"
everytime I do a sideload, the terminal shows 100% transfer but TWRP says install failed! Hello, I have HTC One (M8) Windows phone with Verizon. Is it possible to switch OS from windows to Android? The windows apps are terrible, miss the google apps. At this time there is no way to switch, sorry. For this process, is it important for the device to be S-OFF? No, you only need and unlocked bootloader and TWRP. I can't get past the first step. I get the error: FAILED (remote: err = 0xa). In TWRP, I get the errors: Unable to mount /system and Unable to mount /cache. When I try to flash a ROM, the flashing starts, but returns to the TWRP home screen in less than 30 seconds. Basically, it doesn't install the ROM. I have no idea how to fix this. Do you know what may be causing this error? You can try formatting your phone from the Wipe menu in TWRP. It will wipe your internal storage too. I am using MAC OS X and when I wanted to flash the rom it says cannot read what to do ? Send me a copy of the full terminal log displaying the error. Wipe Cache and Wipe Dalvik. It took me around 5 minutes but still it says "Starting ADB sideload feature.."
Once it says that it started you can go ahead and send the ROM over. Could you pls suggest me which ROM to flash? Is S-Off a pre-requisite to install custom flash? 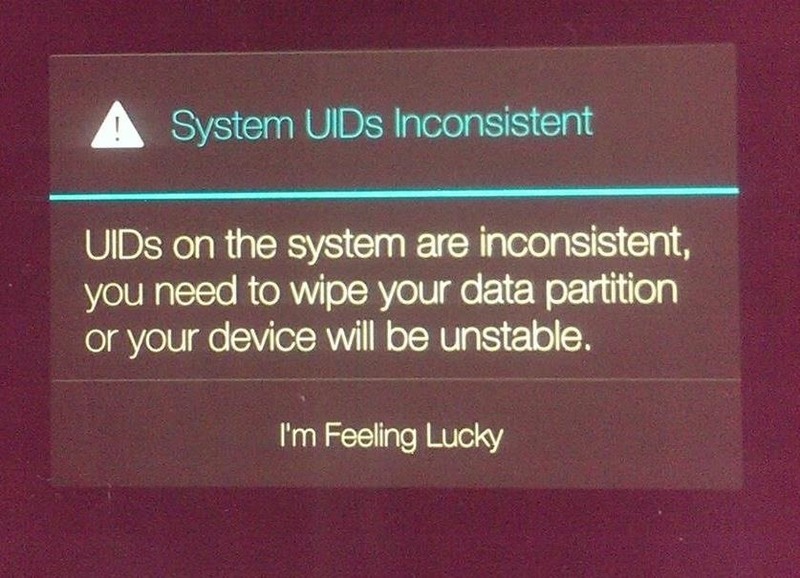 You can go ahead and flash that ROM. S-Off is not required. I am using MAC OS X and when I wanted to flash the rom it says cannot read. What to do? Where did you place the ROM zip? will anyone help me here? i think i have this problem: "If you want to use a RUU, you need about 30% battery. But, if you have less than that, you need to charge it. But the problem is, you can't charge it because you can't boot your phone into either recovery or the ROM itself in order to accept a charge." When I connect my HTC with usb to PC, orange light blinks ant thats it. There is no usb connect sound from pc. My phone is htc M8. Have you dropped your device? Water damage? The M8 eye has a different camera sensor, so M8 ROMs wont't work with it. I could not find a RUU or ROM compatible with it. Maybe try contacting HTC directly and having them send you a link to an RUU that can return your device back to stock. 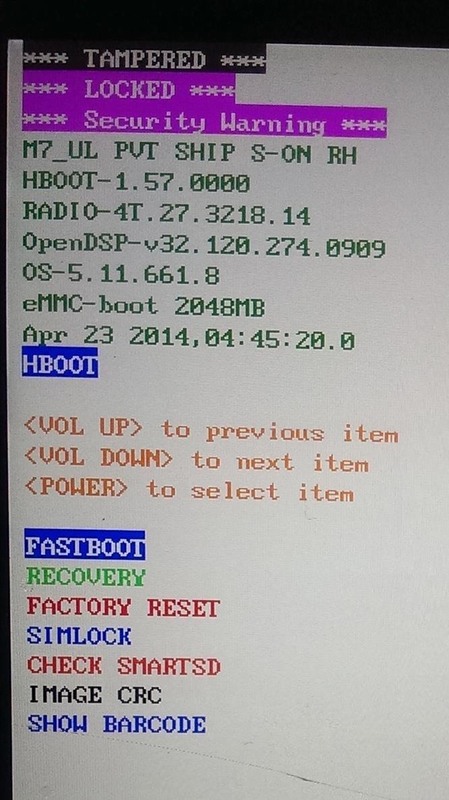 I have htc one m8.I used "fastboot oem reset" through command prompt. Then the bootloader menu is not displaying. Earlier the phone was working perfectly. still the fastboot command is working. at least htc logo is not loading.what can I do for this? I'm sorry, I'm not sure what exactly happened. Can you give me a step by step of what you did to your phone prior to it not working. after the command, phone didn't boot. screen become completely black.but as a fastboot device, computer detect device. when i check model id in fastboot, it shows wrong symbols. 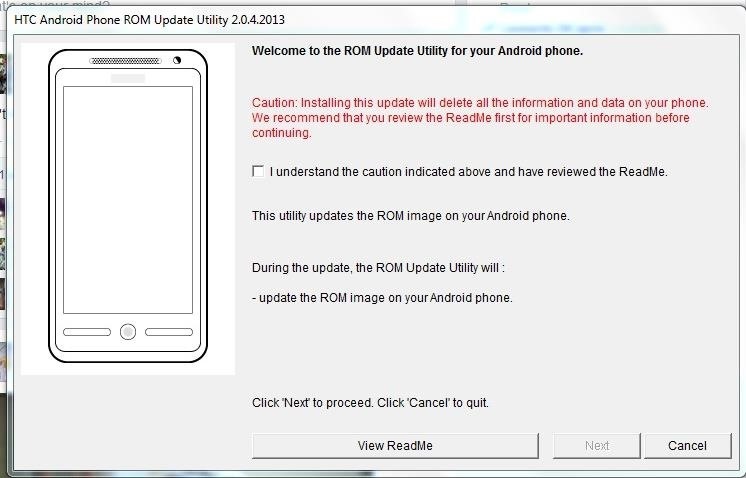 i can't update ROM too. phone goes to RUU mode(htc logo is not loading. ), but it is not updated & screen is dead anyway. bootloader menu is also not displaying. I am very thankfull to you if you can help me here. What type of RUU are you using, a ZIP or EXE? If you are using a Windows PC you may want to consider trying an EXE. under this situation, i think that it'll not work exe file. what type of method can I use to change serial number & product id ? is this a hard brick, isn't it? will I be able to take this device into working condition? How did you change your MID/CID? Is your device S-Off? What RUU are you using to restore? verizon & europe both was used by me. following message is displayed in that 2 situations. Thanks Andrew, this is a good alternative for Mac users. It failed me at flashing because the adb driver was too old for the TWRP to sideload the Custom ROM. So, for legacy users (OS X 10.7 and earlier) this may not work. Flashing can be tricky, but particularly challenging for those who don't read the requirements. Also be very vigilant with the platforms (PC-Mac-Linux) and the OS you're using, as well as the different Apps versions. If Andrew could also edit the wording pointing to the filenames on the desktop it would be more clear: DO NOT CHANGE THE NAMES OF THE DOWLOADED FILES. POINT TO THE LOCATION AND NAME CAREFULLY WITH ONE WORD ON THE TERMINAL COMMAND. Also it would be good to address the possible failures at the critical point of a successful flashing, which is the point of this tutorial. Just so I understand correctly, you have an unlocked bootloader and are S-Off? Helloo ,,,anyone here to help me ? What can I do if fastboot devices command does not show me my phone model? Hi All ... Im Stuck in the step 2... After upload the "twrp3.0.0.1.img" I select the Recovery, but nothing happen the Phone does not restart in TWRP graphic mode. very very veeeeeeeeery thanx for your help bro! sorry for my horrible english, im brazilian and the forums for here are very poor about these smartphones. I managed to fix grace to your tutorial. again, veeeeeery thanx for your help, peace!